'Lea' is a sassy creature. Her traditional silhouette is boldly splashed and enhanced with colourful embroidery in a gently swirling motif. 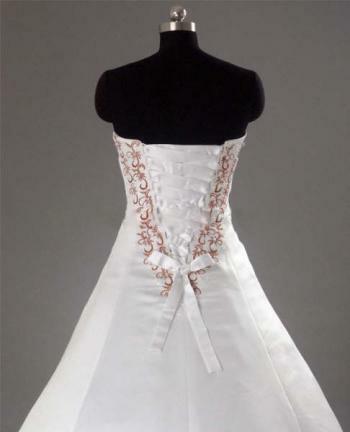 The straight strapless neckline provides the frame for the embroidered panel over the bust, which is them wrapped with a flattering swoop of luxurious satin, falling into a classic full A-line skirt with chapel length train. Another embroidered panel sits beside the waist and yet another decorates the V of her beautiful lace-up back for extra va-va-voom! While we have designed 'Lea' with a lace-up back, you ae more than welcome to request a zip back on this design. 'Lea' is shown with rust coloured embroidery as requested by her proud owner. 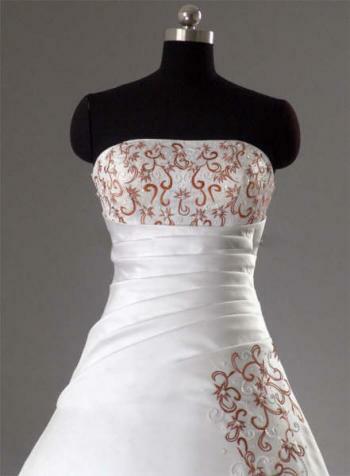 But we are able to accommodate any colour requests for the embroidery, including silver and gold. 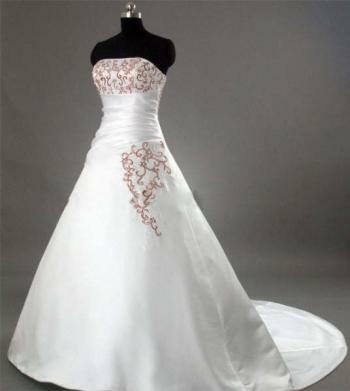 If you love the style of the dress, but want something a little more subtle, we are also able to do the embroidery in a colour matching the gown (white,ivory, etc). The choice is 100% yours! To achieve the fullness shown in the photos, we recommend wearing a petticoat/crinoline under this dress. While not included, we do have a full range available at the best prices anywhere! Check the Petticoat/Crinoline section for more!